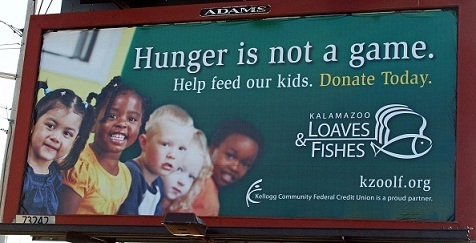 The $394 million Kellogg Community Federal Credit Union has partnered with Kalamazoo Loaves & Fishes on a billboard campaign to help raise funds for the organizations Food is Fuel Kids Campaign. The $394 million Kellogg Community Federal Credit Union has partnered with Kalamazoo Loaves & Fishes on a billboard campaign to help raise funds for the organization’s Food is Fuel Kids Campaign. The Battle Creek, Mich., credit union pooled resources for the 12 billboards and received pro bono help from GreenStreet Advertising and Marketing and Adams Outdoor Advertising.